Want to feel the spring and Easter with all your senses and delight your sweetheart, family and friends with charming, colourful, springlike and stylish details? Click on our headlines and get to work. 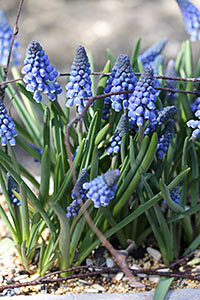 Material: A pretty bowl, some grape hyacinths (muscari), soil and sand; possibly some snail shells or birdseed. 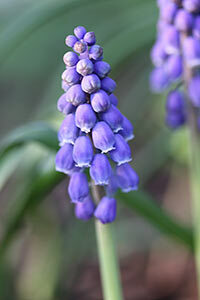 Method: Plant muscari in the container and scatter some sand on top of the soil. If you would like to do a little more, cover the sand with snail shells … or birdseed. The latter will attract lots of songbirds. And they are not just a pretty sight, but will chirp and trill their way right into your heart. 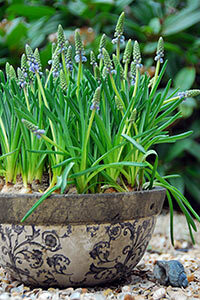 Tip: Muscari planted without a bowl also do well. In niches or on narrow windowsills, two pots will be enough, on tables or other larger surfaces small and large groupings are effective. 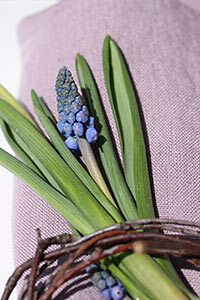 Material: A few birch twigs, a little decorative wire, some grape hyacinths. 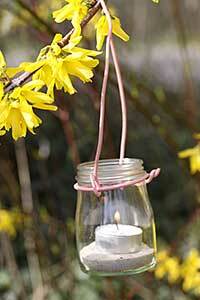 Method: Twist fine, soft birch twigs into a small wreath and tie them with a piece of wire. 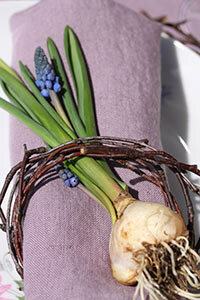 Next, place a festive napkin in the ring, together with a blooming muscari that still has the bulb attached. Of course, the bulb has to be rinsed a little and patted dry first. 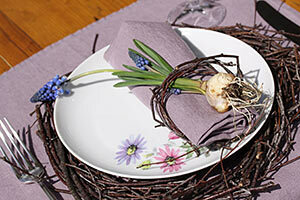 Tip: After the meal the flowers can naturally be re-planted. 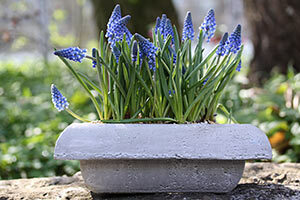 Material: Seedling pots made of peat which look like ordinary little plantpots; plastic; floral sponge; spring flowers; satin ribbon. 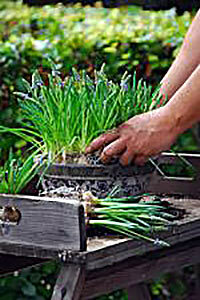 Method: Line the seedling pots with plastic, fill them with floral sponge soaked in water and insert spring blossoms. 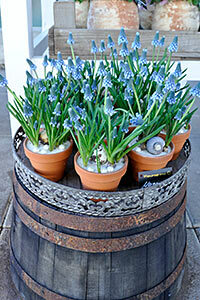 Then tie a ribbon to match the flowers around the pots, and spring has arrived! 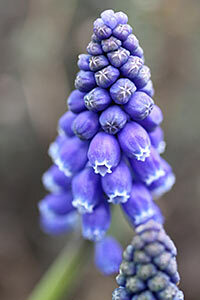 Tip: Only use one colour and variety of flower for each pot. 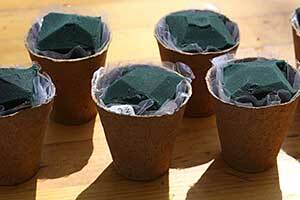 And line the seedling pots really well with the plastic. They are made of peat, and peat absorbs water and then disintegrates. By the way, these cute little “flower vases” can be used individually or of course in groups: in a mixed arrangement on a tray or in a row. 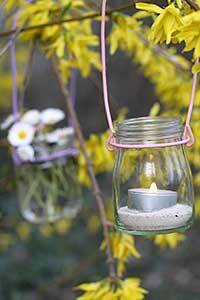 Material: Glass yoghurt pots; 1.8mm-thick wire; tea lights; spring flowers. 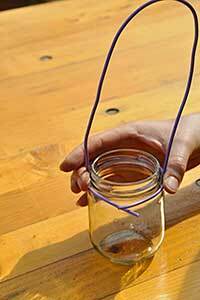 Method: Cut a piece of wire for the handle, make it into a U-shape and bend both ends outwards to form hooks. 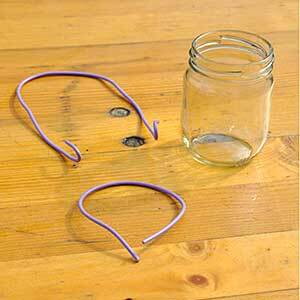 Then cut a second piece of wire slightly longer than the circumference of the yoghurt pot. Attach the handle to it and finally fix it round the neck of the yoghurt pot with pliers. Now all you need is the tea light, then you can hang the storm lantern on an especially cheeky-looking twig or graceful branch. 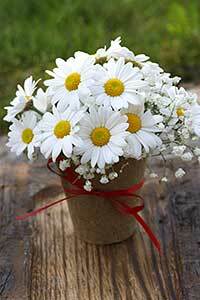 Tip: You can also fill one or two yoghurt pots with water and flowers. 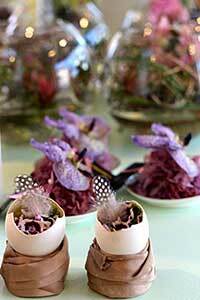 Flower-filled eggs on a tray will add a cheeky touch to your Easter feeling. 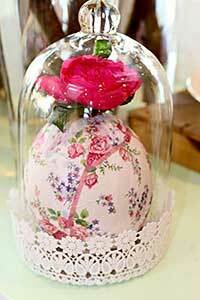 Material: Tray; fresh or blown eggs; spring flowers; empty tea light holders; some straw; Easter and springlike accessories. 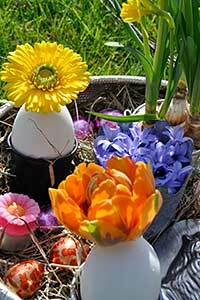 Method: Blow the content out of the eggs so as to leave only one hole (or buy them ready-blown); fill them with water and place brightly-coloured spring flowers in them. Place the eggs in empty tea light holders so that they don’t tip over. Then take a tray, line it with straw and decorate it with your eggs and their springlike fillings and other accessories to create the right mood. 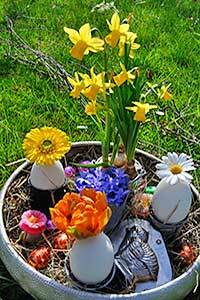 Suggestions are little plants, chocolate eggs, cloth bunnies or a wide variety of other things. 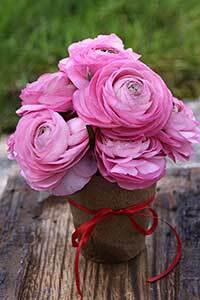 Tip: Because this decoration can be filled over and over again with fresh flowers it will keep for a long time, and cause a sensation on many different occasions. Soloists are artists with such virtuoso talent that they are allowed to perform on their own. Well, these eggs are so special that they, too, can perform as soloists. Material: Blown goose or hen’s eggs; floral sponge; moss; spring blossoms; empty tea light holders; possibly spring or Easter accessories. 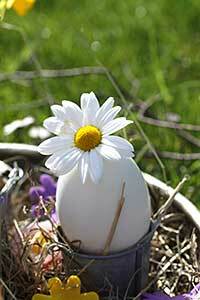 Method: Take the blown goose or hen’s eggs and carefully break off the top third. 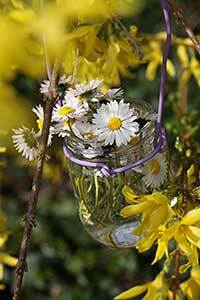 Then fill them with floral sponge soaked in water and cover it with moss. After that you can give free rein to your imagination. 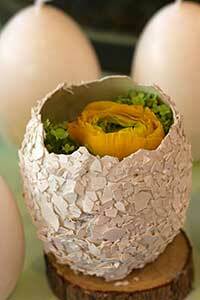 For example, you could fill the egg with viburnum and a yellow ranunculus, which would be reminiscent of an egg yolk. 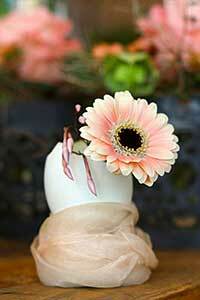 Mini gerbera (germini) with jasmine tendrils are also attractive. However, a sweet william with a feather or another attractive flower, e.g. an orchid, could also look good. By the way, the eggs will be more stable if you glue them to a flat piece of wood or place them in empty tea light holders. 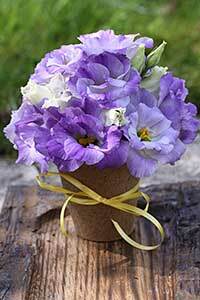 If you use the latter, you can disguise the holders by wrapping organza or velvet ribbon around them. Attach the start of the ribbon to the holder with a little hot glue, wind it a few times around and then attach the other end to the ribbon with a little glue. Tip: The effect will be attractive and very special if you stick pieces of shell from another egg to the outside of the decorated egg.